Ever since Mountain Lion, the next major Mac OS X upgrade, was announced, something has been bugging me. See, a couple of months ago I wrote a post about Lion’s Address Book. The post covered a number of issues, but one of the key points was that the new user interface for Address Book made one of its main features — the ability to organize contacts in groups — much more painful to use. The restoration of the three-column view is a relief, but there is a catch. In order to reap the benefit of Apple’s admission of its own mistake, one will have to upgrade to Mountain Lion, once it’s available. And to me, that’s just not right. I know, software developers do it all the time: major upgrades come not only with new features, but also with fixes for things that were wrong in the previous version and were never fixed through incremental updates. But the fact that all developers do it does not make it right. It’s not just that Mountain Lion will be a paying upgrade. Admittedly, the cost of OS X upgrades has come down substantially in recent times, so it will not be a huge expense. But it is still not fair to ask OS X users to pay for what was essentially Apple’s own mistake. In addition, at this point it looks like there will be many perfectly good Macintosh machines that won’t be supported by Mountain Lion and will therefore be stuck with Lion (and its atrocious Address Book application) until their dying day. I have two 2006 Mac Pro computers that belong to this group. They are both still running perfectly fine and are perfectly usable. They have hard drives that are more recent than 2006, and one of them even has a better video card (a GeForce 8800) that I purchased from Apple itself (MB560Z/A) in December 2008. They have multiple-core Intel processors and tons of RAM. They will be six years old by the time Mountain Lion is released, but it seems to me that they are perfectly capable of running an OS which, from my perspective, looks mostly like a slightly improved version of Lion. But no, at this point, it looks like I will have no choice but to stay with Lion and its horrendous Address Book application on those machines until I get rid of them. Of course, it’s not the end of the world. I will be doing most of my contact information management on a more recent machine, so I won’t have to deal with Lion’s Address Book all that much. But it’s the principle of it. 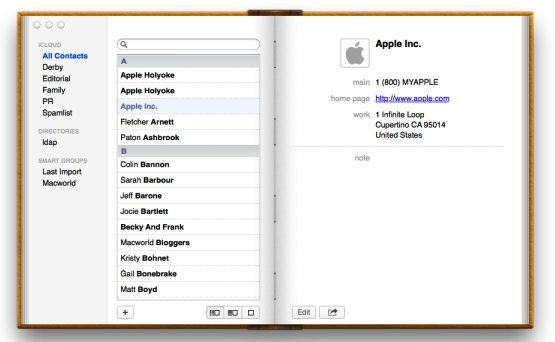 Lion’s Address Book is Apple’s mistake, and they should fix it at their own expense. Yes, providing the three-column Address Book in Lion would cost them extra, but it’s not like they don’t have cash to burn these days. When their developers commit such an obvious, egregious user interface faux pas, they should admit to it and fix it, not just in the next major upgrade, but through a free update for the current OS. It would be a symbolic gesture that would demonstrate that they really care about making their Mac users happy. After all, when they added the idiotic translucent menu bar in Leopard, they quickly realized their error in imposing this visual monstrosity on all users and added an option to turn it off for free in the next incremental OS X 10.5 update. Fixing the Address Book application would be slightly more involved, but like I said, it’s not like Apple don’t have sufficient resources for such a task these days. This entry was posted by Pierre Igot on Thursday, March 15th, 2012 at 8:32 am	and is filed under Macintosh. You can follow any responses to this entry through the RSS 2.0 feed. Responses are currently closed, but you can trackback from your own site.